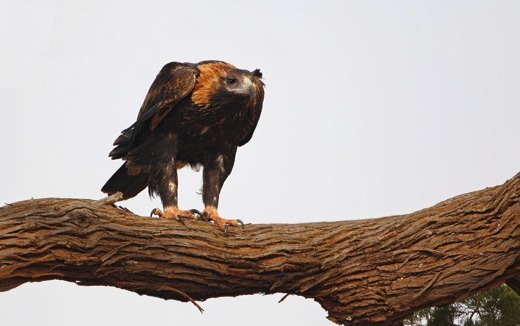 Australia’s largest raptor and the fourth largest eagle in the world, these majestic birds are mostly seen soaring overhead, particularly during the middle of the day as they rise on thermal breezes. At other times, they perch in large eucalypts, especially around forest margins fringing farmland with scattered trees. In the Wangaratta area, they are mostly seen around the Warby Ranges and the Chesney and Mokoan Hills. They are usually seen singly or in pairs but occasionally they form small groups where prey is abundant. They mostly feed on rabbits and occasionally feed on dead animals (carrion) on the ground, such as road-killed kangaroos or farm animals. They have a misguided reputation for being major predators of lambs and they are still illegally persecuted in some areas. Live prey is captured on the ground either after a long flight from great height, or a shorter height from a vantage point in a tree-top. Established pairs may remain in a localised area throughout the year but young birds disperse widely. Adults are recognised by their dark brown (almost black) colouring, whereas younger birds are a much paler brown and have patches of golden brown. Nests are massive structures, often a metre wide and 2-3 metres high, built from large sticks and lined with live twigs and leaves. They lay 1-3 eggs, most commonly two.